**** Chosen by Winner: Mike C.
NOTE: Round trip airfare to Port Elizabeth, South Africa, is the responsibility of the winner. At the time of this posting, the lowest economy airfare was approximately $1,200 round trip per person from the U.S. (JFK - PLZ) on South African Airways. Other airlines will typically cost more. Click on "VIEW FULL DETAILS" for complete inclusions and exclusions. NOTE: DISCLAIMER: Due to the recently increasing political uncertainty regarding property rights in South Africa, there is no way to guarantee that this Safari prize will be claimable during the next hunting season or that a winner will deem it safe to travel. A winner who selects this prize indemnifies Knife Rights, Inc., its officers, directors, affiliates, professionals, personnel, representatives and members, together with Tollie's African Safaris and its owners, officers, directors, affiliates, professionals, personnel and representatives from any liability whatsoever in connection with any loss incurred, including non-reimbursable travel or failure to be able to deliver the prize to the winner. An extraordinary African adventure awaits. 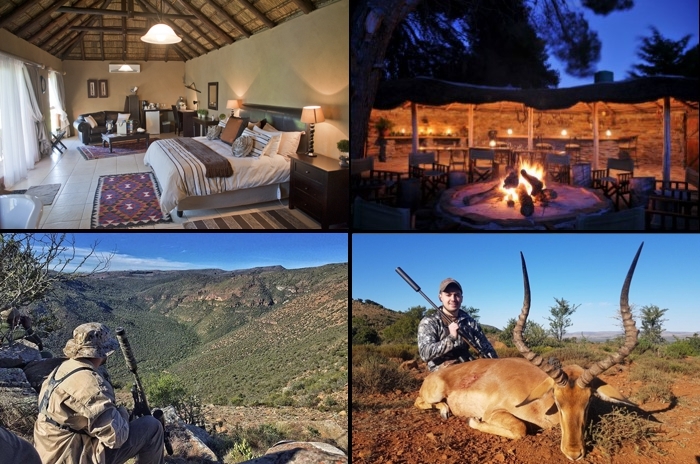 You will enjoy the gracious South African hospitality of Tollie and Karen Jordaan for seven days (five hunting days, no hunting on Sunday) while hunting for three wild African animals. License and trophy fees included for: 1 Impala, 1 Blesbuck, 1 Springbuck. Accommodations for two (one hunter, one non-hunter observer) included. NOTE: Roundtrip airfare to Port Elizabeth, South Africa, is the responsibility of the winner. At the time of this posting, the lowest economy airfare was approximately $1,200 round trip per person from the U.S. (JFK - PLZ) on South African Airways. Other airlines will typically cost more. Scroll down for complete list of inclusions and exclusions. "Tollie's was amazing, great people, great time and great hunting. Trip of a lifetime!" - Jamie S.
"It was amazing in every respect. Great place, great family, great hunting!" - Mark S.
2014 Ultimate Steel™ Tollie's African Safaris Winner - Just two of a six taken. NOTE: Due to the requirement for travel and other expenses on the part of the winner, tickets will continue to be drawn until this prize is chosen or all tickets have been drawn. NOT transferable. The services of an experienced professional hunter and his staff, including trackers and skinners. All concession fees in South Africa. All hunting licenses in South Africa. A fully equipped hunting vehicle per professional hunter. Full accommodation and meals for two (one hunter and one non-hunter). Excellent cuisine including ample fresh produce and fruit. Spirits, wines, beers and soft drinks. Scheduled airport pick up and return. Airfares: international, national or charter. Trophy fees of animals killed, wounded and lost, except for the three included in the package. Any costs arising before or after scheduled pick up or departure. Freight charges for shipment to USA or any other country, customhouse broker fees, insurance, inland freight from airport to taxidermy studio or tannery or to your home. Staff gratuities. Normally in the region of US$30 per day for staff (this includes trackers, skinners, cook, cleaning ladies, laundry ladies.) Tips for PH varies from US$90 - US$150 per day. Dip and pack - or you can have them mounted with us, see African Pride Taxidermy. For a video of your hunt, see options from Igala Productions.